St. Francisville is a town in, and the parish seat of, West Feliciana Parish, Louisiana, United States. The population was 1,712 at the 2000 census. It is part of the Baton Rouge Metropolitan Statistical Area. Location of St. Francisville in West Feliciana Parish, Louisiana. St. Francisville is located at 30°47′5″N 91°22′50″W﻿ / ﻿30.78472°N 91.38056°W﻿ / 30.78472; -91.38056. According to the United States Census Bureau, the town has a total area of 1.8 square miles (4.7 km²), all land. The town of St. Francisville was established in 1809, and a number of historic structures from that period still exist. Called "the town two miles long and two yards wide" because it was developed atop a narrow ridge overlooking the Mississippi River, it was the commercial and cultural center of the surrounding plantation country. Below St. Francisville's bluffs, another early settlement called Bayou Sara had been established by French colonists in the early 1790s. It was at one time the largest antebellum Mississippi River port between New Orleans and Memphis, but was superseded by Natchez. The settlement was gradually destroyed by repeated flooding and fires, and nothing exists of Bayou Sara today. A few of its surviving structures were hauled up the hill into St. Francisville in the 1920s. This area and other former French-controlled territories east of the Mississippi River was taken over by Great Britain after it defeated France in the Seven Years' War in 1763. At the end of the American Revolutionary War, Great Britain ceded what it called West Florida to Spain in 1783, as part of the Treaty of Paris. There were years of contention as to exactly where the eastern boundary of the 1803 Louisiana Purchase was—depending on which treaty was cited, as France, Great Britain, and Spain had redrawn the boundaries among themselves during the second half of the 18th century. Spain continued to claim territory on the eastern side of the Mississippi River until it and the United States settled this issue in the Pinckney Treaty. 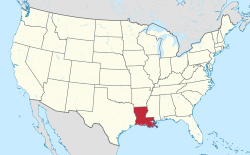 This region is today called the Florida Parishes. In 1810, St. Francisville served as the capital of the Republic of West Florida, when area planters ousted the Spanish government of the Baton Rouge District and set up their own independent republic for 74 days, before being annexed to the Territory of Orleans, as a possession of the United States. In 1824, when Feliciana Parish was split into East and West, St. Francisville became the seat of West Feliciana Parish's government. In June 1863, Confederate Army officer William Walter Leake arranged for the burial here of Union Navy officer John E. Hart, who had died aboard his ship while taking part in the Union blockade of the Mississippi River. This event is re-enacted every June during a three-day commemoration called "The Day the War Stopped." After the American Civil War, some Jewish emigrants fleeing religious persecution in Germany settled here. They made important contributions to commerce in the lean years following the war. Becoming successful merchants, they provided credit when the banks failed and built impressive Victorian homes, such as the Wolf-Schlessinger House. 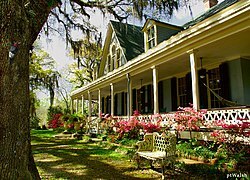 It is now operated as the St. Francisville Inn Bed and Breakfast. In recent years, community efforts have focused on restoration and preservation of the town's historic homes. St. Francisville is a popular tourist destination, with a number of restored historic plantations open for tours, including Rosedown Plantation State Historic Site, Audubon State Historic Site, Butler Greenwood Plantation, the Myrtles, and the Cottage Plantation, as well as several antebellum gardens. In May 2011, low-lying parts of Saint Francisville flooded in the Mississippi River floods of that year. In the town, the population was spread out with 27.3% under the age of 18, 8.8% from 18 to 24, 29.2% from 25 to 44, 22.5% from 45 to 64, and 12.1% who were 65 years of age or older. The median age was 35 years. For every 100 females, there were 95.9 males. For every 100 females age 18 and over, there were 91.4 males. The United States Postal Service operates the St. Francisville Post Office. Anne Butler, noted author born in the town of St. Francisville. Hattie Moseley Austin, born Hattie Gray in St. Francisville in 1900, founder of Hattie's Chicken Shack in Saratoga Springs, New York. Chris Broadwater, current District 86 state representative, was born in St. Francisville in 1972. Gil Dozier, former state commissioner of the Dept. of Agriculture and Forestry; practiced law in St. Francisville prior to 2011. Samuel Lawrason, state senator who authored the Lawrason Act regarding municipal government; practiced law in St. Francisville from 1875 until his death. John Rarick, former state district judge and U.S. Representative; lived most of his adult life in St. Francisville. West Feliciana Parish Public Schools serves the city. All of the public schools in the parish are located in unincorporated areas. Julius Freyhan High School, the first public school in St. Francisville, was named after Jewish businessman Julius Freyhan. After his 1904 death, Freyhan bequeathed $8,000 (about $223081.48 in today's currency) to have it built.) Freyhan High was built in 1907. The school was later rebuilt and renamed after him and it served the community until the early 1950s. As of 2013 it is being restored to serve as a community center and a museum. The West Feliciana Parish Library is located in St. Francisville. In 1996 the library moved into its current facility, a former U.S. post office at 11865 Ferdinand Street. The library, previously a part of the Audubon Regional Library System, became independent in January 2004. ^ Mayor Aquilla is listed among the state and local officials who have endorsed the reelection in 2014 of Democrat U.S. Senator Mary Landrieu. ^ Peña, Christopher (2008). The Day the War Stopped. ^ "Saint Francisville." United States Postal Service. Retrieved on March 21, 2013. ^ "Running for Office: Chris Broadwater, Louisiana House District 86". Baton Rouge Morning Advocate. Retrieved May 17, 2012. ^ "Gilbert L. Dozier, Lawyer". legaldirectories.com. Retrieved June 10, 2013. ^ "Warren Davis Folkes". findagrave.com. Retrieved December 31, 2014. ^ "Running for Office: Kenny Havard". Baton Rouge Morning Advocate. Retrieved May 17, 2012. ^ "Rep. Thomas McVea (R)". congress.org. Retrieved July 18, 2011. ^ a b St. Francisville, Louisiana (Archive, Encyclopedia of Southern Jewish Communities. Goldring/Woldenberg Institute of Southern Jewish Life; retrieved February 21, 2013. ^ St. Francisville Historic District. National Park Service; retrieved March 21, 2013. ^ Directory, West Feliciana Parish Library; retrieved September 29, 2010. ^ About Us, West Feliciana Parish Library; retrieved on September 29, 2010. Wikimedia Commons has media related to St. Francisville, Louisiana. Country Roads Magazine Published continuously since beginning in St. Francisville in 1983.